Alibi, clearance, confession, cop-out, cover-up, excuse, defence, extenuation, facade, gloss, immunity, guise, indemnity, justification, lie, mitigation, pardon, pretense, pretext, rationalisation, reason, sham, story, subterfuge. Goodness gracious; its been a while. What reason could there possibly be for not writing one's blog for so long? If you could think up a suitable excuse, I would be very much obliged. If you leave a suggestion here, I will also pop you in the running to win a copy of the "2011 Sewing Calendar" released by Accord Publishing. Entries are open until 9am Thursday 30 December (Australian Eastern Standard time) and anyone is welcome to enter. A winner will be drawn at random and - being as 2011 is almost upon us - the calendar sent post haste. In the meantime, here is a little more about this lovely calendar. 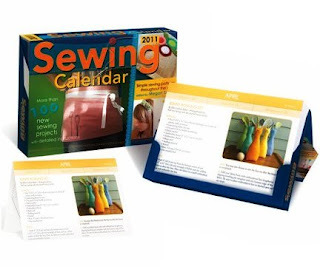 The year-round sewing enthusiast will love this calendar. 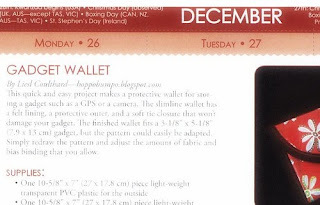 There are over 100 terrific projects for everyday home use, as well as lovely gifts for giving. If you enjoy reading sewing blogs, you will recognise many of the contributors, including these talented ladies. There's a new project every three days, presented as a handy fold-out page. Step-by-step instructions are accompanied by illustrations and pattern pieces. Thank you to Megan Smith, for including a project from me too. Coincidentally it falls exactly one year from today - 26 December. Maybe I'll see you this time next year for a spot of sewing? Your sewing machine fell on you and pinned you to the ground? And you couldn't get off the floor and the whole family didn't come to check if you were okay because they thought you were just up to your lightsabres making another Jedi Robe? I don't know - it's late and I'm brain-fried after xmas..... but I think I'd be mentioning the Pants of Misfortune (perhaps in a Wallace & Grommet-Wrong-Trousers-style caper)....? Obviously you were kidnapped by space aliens wanting sewing lessons. Argy and Bargy didn't report you missing cos they were to busy building a Millenium Falcon replica in your living room using cardboard boxes. Mr HoppoBumpo eventually noticed you were gone and rescued you when he ran out of clean socks. Oh good heavens, what excuse DOESN'T work in December?! Santa kidnappped you and forced you to work in his shop? You were simply enjoying your holiday season? You were temporarily turned into a turnip?? Merry Christmas, and happy new year, either way!! Can't compete with some of those previous entries. Needless to say, the dog ate your homework. Its early, i can't think of anything other than the dog ate your computer. You got lost in your sewing room and couldn't get out when a pile of fabric fell on top of you? I could see that on my obituary lol. Glad to see you Leisl. Hope you and your family had a great Christmas. Santa stole you and put you to work sewing pencil rolls for Christmas stockings. What ever the reason - welcome back!! Who cares where you've been---we're just thrilled to have you back! You managed to break both arms in a freak sewing accident and when you tried to apply 'skelo-grow' to them you discovered your bottle was long out of date and you couldn't reach out to the lovely blogging community to let them know because typing was impossible! The dog ate your blogspot??? It's a somewhat delayed post-Blogtoberfest hibernation? Welcome back! For Liesl (of the sewing kind). Was she lost in a fabric shopping trolley? How much material by the meter? What kept her off until today? Anyway it is good to have you back from where-ever you have been. I do hope it was good. 50 days?!!! Blimey! Well, if you were me, you could just say that you're pregnant and everyone is lucky that you blog anything at all. The pencil roll suggestion doesn't cut it for me either, as I spent a week before Christmas making eight of them, so unless you were making like 50,000 of them for an orphanage or something, then really, it's no excuse. Maybe you just got busy making stuff instead of talking about it? Look - here's the deal. You just get back to blogging like you usually do, and we'll all pretend it never happened, okay? If you send ME the calendar, I promise never to mention it again. wow, has it been that long!! maybe your were at bloggers anonymous doing a 12 step program & you couldn't get back to blogging as then you'd fall off the wagon and miss out on your 50 day medal. or you just have a life & blogging had to wait. Hope you had a nice break and that the coming year treats you well. bout how you were hand picked (on the basis of your blog showing what an ingenious person you are of course) to be Oprah's personal production assistant while she was here. Of how you roganised massive feasts with Donna (hay of course) and Curtis, scheduled flights all over the country for her many guests and chatered the way climbing up the Harbour Bridge then lead everyone in a rousing victory song once you all reached the top. Still you did a great job with the rest. Well, maybe in a wine-induced daze of reckless altruism you offered to outfit a 50-member choir...only to realize that meant 50 different pattern alterations. Between the FBAs, SBAs, the hems, the sleeve widths, well, 50 days goes by so fast. Now the real mystery remains: what were you drinking!?!?!? I assumed you were on a time traveling mission, summoned to the future where it was necessary for you to intervene. Just what you did to save the future of sewing for rest of us is for you to reveal or keep to yourself. Thanks for ensuring the availability of fabric, thread, sewing machines and notions for us and our progeny into the future.